The man has since retaliated with a police report against her as well. "He has been tagging my name on Facebook since Friday (25 January), and he claimed that he knows where I stay and wanted me to accept his friend request," Saw said in a press conference yesterday, 27 January. 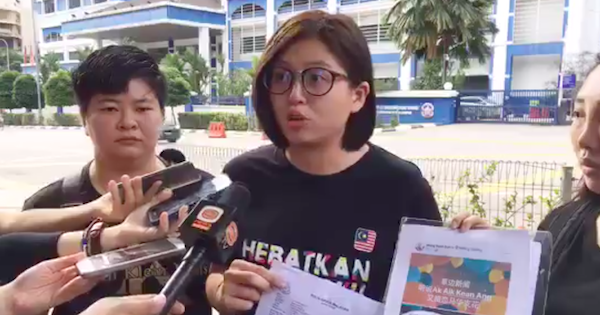 She revealed that she had only met the man once at the Cameron Highlands by-election, where she was collecting signatures for a petition to oppose the abolition of the death penalty. Screenshot of the man who tagged Saw and wrote, "Lenglui, why haven't you accepted my friend request? Do you know you're breaking my heart?" "Lenglui, shall we go for breakfast together?" Ang wrote. 'Making sure' that she had her lunch, Ang also told Saw in another comment that she should not starve herself as it would break his heart. In another comment, Ang said that his 'wait' for Saw's response was breaking his heart. "I don't care who you are and what your status is, respect between both sexes is needed in our society," she wrote in the Facebook post yesterday, 27 January. "I don't know you, and I don't want to know you. I don't need you commenting on my looks and body," she added. 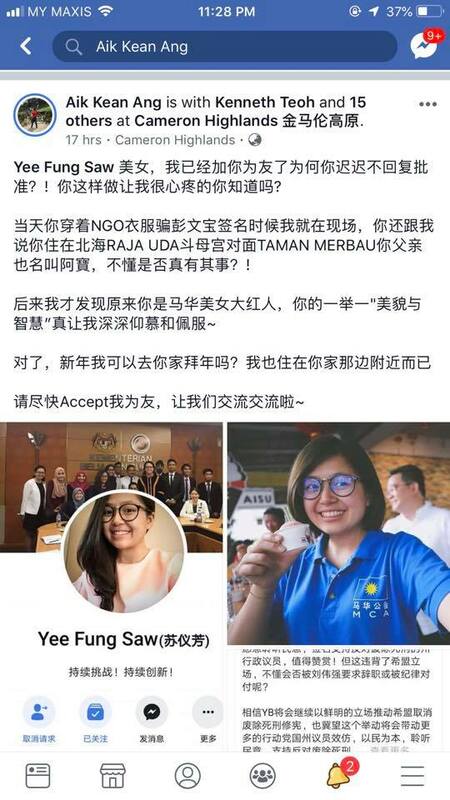 "Only those without basic decency will choose to hurt women in this way," the Pahang MCA Youth Secretary wrote. Saw has also included a screenshot of a Facebook post, uploaded by another Facebook user, alleging that Ang wants to sexually harass her. However, the post was not published by Ang himself. "Having a Facebook friend who checks on you daily, how does that constitute harassment?" Ang said after lodging the report at the Mak Mandin police station today, according to Kwong Wah. Kwong Wah reported that Ang, a DAP member, also demanded an apology from Saw within the next 24 hours, as her 'accusations' have tarnished his image – especially with the sexually-charged Facebook post that was not published by Ang. "(Her) actions have caused the public to label me as a sexual predator," he added. Ang (centre) was accompanied by a fellow DAP member from the Bagan division (right) today, 28 January. Six senior citizens collapsed at ICC Pudu indoor market today, 28 January. The cause of the fire is yet to be known.